The Galaxy Nexus has an outstanding fan base among the developer community and it completely shows when you poke your head into these forums. After receiving plenty of requests for us to post some custom ROM goodness, here is a ROM called the Android Open Kang Project (AOKP). It is based on Android 4.0.3 and has all the features you would hope for when flashing a ROM to your brand new Galaxy Nexus. There are a few main things people look for when flashing ROMs to the G-Nex. They need to be able to switch up the colors on the navigation bar, add system toggles to the notification bar, switch up their lockscreen to have more than just unlock/camera options, and of course they need WiFi tethering. From what we have experienced, you can do all of that and a whole lot more. AOKP comes with the stock 1.2 GHz kernel that is set to an interactive setting. For battery life, it is one of the best I have seen on a device. 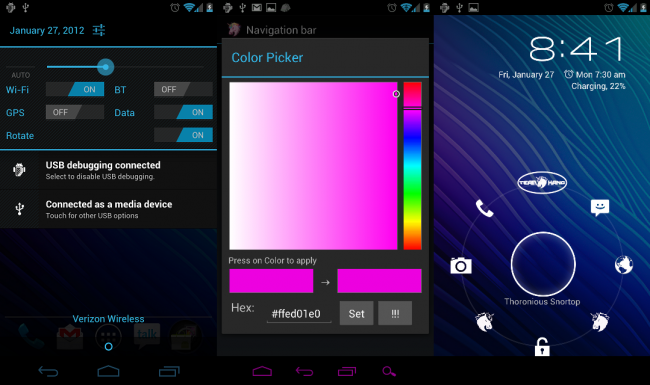 If you have been looking for a good custom ROM to throw on your device, then look no further. Reboot into ClockworkMod Recovery and wipe data/cache. Once finished installing, then install Gapps zip. After reboot and setting up your Google account, reboot again. After you have finished all of those steps, you’re ready to party. For further instructions and info on the Android Open Kang Project, check our their forum entry over at RootzWiki. If you have any troubles, just ask below and we will do our best to help you through the process. Enjoy!